Installed some new parts for the Sport today. So after I installed those, I went to go get it aligned, because I can't afford to wait until another day or two when I can get it aligned for $20 by a buddy my dad works with. Took it up to Tire Kingdom for an $80 alignment. 5 Hours later of my truck sitting in the parking lot, they put it up on the ramp for TEN MINUTES if that, and come back in and tell me that "Well, I don't want to do the alignment until you get a new steering box put in, because it'd be a waste of time." So I rebutted with "Well, when I got the truck, it had play in the steering wheel, but not even close to enough to cause it to be a major problem. So you're telling me that you won't align the truck until I get a new box?" "Yeah, that's what I'm telling you." It basically ended with, "Get my @#$%ing truck off of that ramp, I'm going home." Technically, play in the steering box itself has NO effect on front end alignment. Alignment includes caster, camber, and toe-in. In an MJ, camber is not adjustable (except by replacing the ball joints). 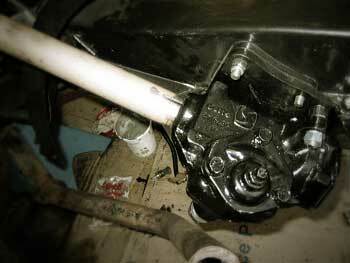 Caster can be adjusted by adding or removing shims in the frame pockets where the lower control arms attach. That rarely needs attention. Toe-in is what usually needs to be -- and gets -- adjusted. The tech could have done the alignment -- he wanted to sell you a steering box. Don't go to that shop again. I hate shops that try to "upsell" unnecessary work before they've even looked at what I asked to have fixed. How much slop do you have in your steering wheel, and have you tried adjusting the over-center screw on the box? Alignment shops won't do an alignment with a bad steering box because they have customers that think it will solve every problem they have. I know first hand and a bad steering box with tons of play will have a slim chance at centering the steering wheel. "You aligned my vehicle and now you have to fix it for free since my vehicle isn't right". Some shops, (most) do up-sell as it is part of their profit margin but they have to protect themselves also. Yeah, I can understand that, but at the same time, I really don't enjoy going to this place for anything other than just picking up tires. I know that my steering box needs to be replaced. It's 24 years old, don't ya know. I don't have the money to spend for a $200 brand new box. That I have to drive 60 miles roundtrip to and from work 5 days a week and NEED MY TRUCK ALIGNED. And then they still don't want to do the work for me? Obviously my $80 + tax isn't enough to motivate them. I apologize if this sounds like a rant, but I was pretty upset this afternoon when everything happened. Chances are even if you do get a new "remanufactured" steering box, it will still have slop. I heard of guys going through four of them before they found a tight one. I think they have monkeys rebuilding them. Go to the junkyard and look for any low mileage 93-98 ZJ box. I got one with 70K on it for $50 and it was like new. Plus it's a little quicker ratio and feels a lot better than the stock MJ box on the road. It's bolt-in, only you'll have to reuse your original Pitman arm. They tried to screw your dad and you went back there? :no: Last place that tried screwing my dad over with his truck told me not to ever come on there property again you can quess why. Thanks for the tip Don. I have a bone to pick with ZJ's. (looking for a stock amplifier to run.) Unfortunately, it seems the only local P&P I have time to go to is... Always fresh out of any type of Jeeps. :( :fs1: Now, since mine is a standard, I'm assuming that I'll have to get one from a standard? Or are these things swappable without any negatives or downsides? RE: Go to the junkyard and look for any low mileage 93-98 ZJ box. I got one with 70K on it for $50 and it was like new. Plus it's a little quicker ratio and feels a lot better than the stock MJ box on the road. It's bolt-in, only you'll have to reuse your original Pitman arm. Did the same thing, except I was able to use the Pitman arm that came with the box just fine. Cost me $30, plus a few hours labor. Charging $80 (and up) to adjust toe only is criminal, and they do it many times per day. Time to whip out the tape measure. You can get your toe set by yourself just fine, which is all the shop would do anyway. For years my brother kept modding the suspension on his bmw...custom camber plates on the front, welded adjusters to the rear subframe, constantly changing coilovers. I kept bugging him to bring it by my work so I could do a real alignment instead of his tape measure floor job. He finally did. After not having to adjust anything, I stopped doubting the tape measure alignment. I took my YJ. my GF's YJ and my Sons XJ up to goodyear in Ocala,Right there off main street.i think for lifetime it was 120$ and for a one time alignment it was 60.
i took my comanche to a place here in N.C. to have it aligned and sure as hell they told me it needed a steering gear box before they could do anything with it. the Tech drove it and said its really not to bad alignment just take it home and do the tape measure thing on it which is what i had done to start with.wound up having some loose nuts on tie rod ends anyway so didnt need the alignment.but basically I'm saying you can align them yourself with a tape measure, and that's what they will do at a shop if you have big tires and rims anyway. Park on a level place with the wheels pointed straight ahead. This is important, so make sure. Set the parking brake, put it in PARK if you have an automatic, and chock the rear wheels. Turn the ignition key to the first position after LOCK. You want to be able to turn the steering wheel, but you do NOT want the engine to start. Now -- roll down the drivers window, stand outside the door, and gently rotate the steering wheel through the range of slop. DO NOT TURN HARD ENOUGH TO ACTUALLY MOVE THE TIRES. All you're looking to do is see how much slop there is. In the lower part of the photo, do you see the "turret" that's attached with three bolts and has a stud and locknut in the center? That stud is the over-center adjustment screw. You'll need a box-end wrench for the locknut and an Allen key for the adjusting screw. Sorry, I don't remember the sizes. Loosen the locknut while holding the screw in place. Back off the locknut a couple or three turns, at least. Remove the box-end wrench. You are now ready to adjust. You can rotate the steering through the slop range from under the hood by grabbing the flex flange where the steering shaft attaches to the steering box. What you want to do is wiggle it back and forth while GRADUALLY screwing the adjusting screw in. You should feel the slop range decreasing as you screw in the adjuster. DO NOT try to take every last micron of slop out. The box needs a small amount of "lash" to keep from binding up. Just take most of it out. Once you've got it so there's only a tiny amount of slop, hold the adjuster with the Allen key and tighten the locknut. Note: If the steering box is completely trashed, the adjusting screw will bottom and you'll still have slop. I've only seen one box like that ... ever.